Bittersweet chocolate cupcake with melted marshmallow inside and chocolate fudge frosting. In a bowl, using an electric mixer, beat together sugar and oil until well combined. Add egg whites, one at a time, beating well after each addition. Beat in vanilla and melted chocolate. Alternately beat in flour mixture and buttermilk, making three additions of flour mixture and two of buttermilk, beating until smooth. Beat in chocolate liqueur. Scoop batter into 12 muffin cups lined with paper liners. Bake in preheated 350-degree oven 20 to 25 minutes or until tops of cupcakes spring back when lightly touched. Let cool in pan on rack for 5 minutes. Remove cupcakes from pan. 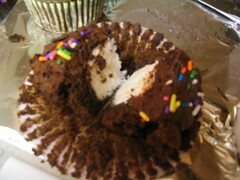 While cupcakes are still hot, using a spoon, scoop a hole in the top of each cupcake, scooping down to the center. Push a marshmallow into each hole. Don’t worry if marshmallows stick up a bit from top of cupcakes. The heat of cupcakes will soften marshmallows. (Discard scooped out cupcake or save to nibble on.) Let cool completely on rack. Top cooled cupcakes with Chocolate Fudge Frosting. Makes 12 cupcakes. In a food processor fitted with metal blade, process 1 1/2 cups powdered sugar, 3/4 cup unsweetened Dutch-process cocoa powder, sifted, 1/2 cup unsalted butter, at room temperature, 2 tablespoons chocolate cream liqueur, 1 tablespoon strong brewed coffee or milk and pinch salt until smooth, scraping down sides if necessary. Spread frosting on cooled cupcakes. Makes about 1 1/2 cups. Note: The recipe says to let the cupcakes cool in the pan for five minutes before scooping out the center. Don’t wait–I did on the first batch and by then they were too cool to melt the marshmallows. Just scoop straight from the oven. I’m not sure where this recipe is from. It was in my binder of printed recipes. Holy crap – this is not the blog to look at when I\’m hungry. I linked to your site! Great blog! I write a food blog called cheftami at http://cheftami.blogspot.com/ check it out if you have a chance. I will stop by again soon. The chocolate surprise cupcakes look yummy. 1 pack cream cheese – room temp, a splash of vanilla, 2/3 c. of powdered sugar or to whatever sweetness you like. mix it. the middle may fall a bit as it cools, but that will just hold more cream cheese icing… you can also add dried cherry or cranberry to the filling for an extra treat. Been loving these since my mother started making them 40 years ago… we all share the recipe with everyone we can. if you think their good warm… just wait – put ’em in the fridge until cold cold cold then, enjoy!